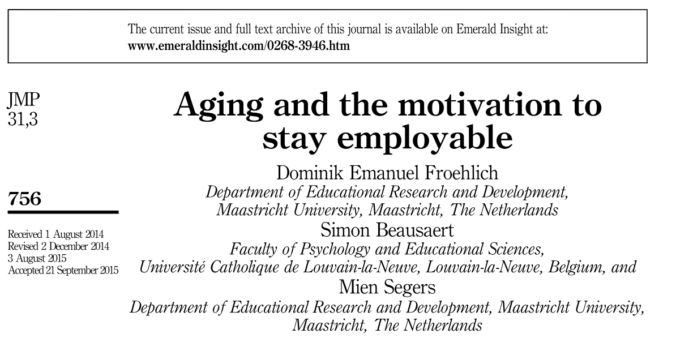 In 2016, my paper “Aging and the motivation to stay employable” was published in the Journal of Managerial Psychology. Purpose – The demographic shift and the rapid rate of innovations put age and employability high on policy makers’ and human resource managers’ agenda. However, the authors do not sufficiently understand the link between these concepts. The authors set out to investigate the relationship between age and employability and aim to identify motivational mediators of this relationship. Therefore, the purpose of this paper is to investigate the roles of future time perspective and goal orientation. Design/methodology/approach – The authors conducted quantitative, cross-sectional survey research (n=282) in three Dutch and Austrian organizations. The authors used structural equation modeling to investigate the relationships between chronological age, future time perspective, goal orientations, and employability. Findings – Future time perspective and goal orientation strongly relate to employability. The authors found indirect relationships between age and employability via perceived remaining opportunities. Research limitations/implications – The results question the often simplistic use of chronological age in employability and human resource management research. Therefore, the authors call for more research to investigate the relationship between age and employability more deeply. Practical implications – The findings contribute new insights for the career development issues of an increasingly older workforce. This shifts the focus from age, a factor outside our control, to motivation. Originality/value – This study contributes evidence for the relationships of chronological age, future time perspective, and goal orientation with employability. It extends literature by criticizing the prevalent use of chronological age and investigating mediation effects. Access the publication via the publisher’s website or drop me a line.